The curse of apathy is the number one enemy of America, and I refuse to allow the sacrifices of U.S. military heroes go for naught. Activism is the duty of all Americans. An experiment in self government demands participation by all who benefit from it. These heroes, these military warriors, who volunteered to crush evil wherever they could find it—if they are so willing to sacrifice so much, how dare any of us not participate? So to each of those gun owners that don’t participate in the freedom provided by the sacrifices of warriors, I would beg thee, to do some research, visit a vet’s home, salute some flag-draped coffins, hold a crying mother and reconsider whether you might owe somebody something. Cox: That’s a powerful statement. What message do you have for those 20 to 25 million gun owners who aren’t registered to vote, who have chosen not to participate and are truly not able to make a difference? Ted: Everywhere I go, every interview I do, I basically say if you’re not a member of the NRA you’re helping the enemy which makes you the enemy. Now a lot of gentle souls across the land have their feelings hurt when I say that, but it’s time to hurt some feelings because that statement is accurate. The tip of the culture war spear is our Right to Keep and Bear Arms. Cox: Is that why some people call you an extremist? Ted: Extremism is the American way. A student at a school where I recently spoke asked me if I dabble with instruments other than guitar. I simply stated that I do not dabble in anything. I go for it in everything I do. I cherish life extremely. I extremely love my country and family. I feel extremely committed to participate in the freedoms provided by hero warriors of the U.S. military who sacrifice it all so that I can. I am extremely alive. That’s why when Glenn Beck wants a Second Amendment statement, he gets Wayne, he gets you, but he also gets me. I’m a trench warfare guy. And without question that’s the most important perspective on all the issues right now, but specifically the Second Amendment. Cox: And that attitude of being in the trenches carries over into your activism in support of the Second Amendment. Ted: The key—and I hammer this relentlessly—is simply “do something.” Buy a soldier a membership. Buy a kid a membership. Write a letter to the editor. Initiate the dialogue. Don’t ever wait to argue the point. Don’t respond. Initiate. It’s a very simple argument about the Right to Keep and Bear Arms: “Keep” can only mean one thing—“it’s mine and you can’t have it.” “Bear” can only mean one thing and one thing only—“I’ve got some on me right now.” That’s my daily mantra. It’s my driving force. It’s my quality of life. When I go to bed at night, if you were in the cabin, you could hear little chuckles coming out of my bedroom. Because I guarantee you that somewhere that day, everyday, 365 days a year—I have caused an anti-gunner much anguish. Look at what’s happened every year since I became a speaker at the NRA Annual Meeting. My seminars are packed, because people are so relieved to hear publicly what they live privately. And again I appreciate that support, but the battle cry of my life, and the battle cry of certainly my NRA presentations is, “Don’t wait to hear it from me! You do it at school and at church and at the workplace. You do it at the town hall meetings, you write the letter to the editor.” Instead of just accepting and being angry at the mantra in the media, counter the mantra. But it can’t be once or twice a year, it’s got to be once or twice a week. Cox: Tell me, a lot of gun owners thought that the Heller case decided it all. Obviously, that decision was limited to D.C. and federal enclaves. Now we have the Chicago case pending before the Supreme Court. What do you think about the notion that Chicago argued—that actually Heller was okay because it was just D.C., but it doesn’t affect the rest of the country. Ted: I could get into specific details about that question and the answer that it beckons, but I will simplify it by this: there is planet Earth and then there is Chicago politics. There is common sense and logic that is ubiquitous across the United States of America. Then there are the words of Mayor Daley as he belittles the concept that an individual American has a God-given right. Or, in Mayor Daley’s perspective, does not have a God-given right to self-defense. Mayor Daley gets up under the umbrella every day of his life with an armed security detail paid for by tax dollars. I didn’t need the Heller case and I don’t need the Chicago case. I have a deal with God. My right to keep and bear arms preexisted. I had it when I was conceived. But it was important to write down those inalienable rights coming out of the grasp of tyranny and the European slavery. So it’s good that our Founding Fathers did write it down for reference—just in case. And now here we are. Cox: One of the bigger problems we face is not fighting our enemies—it’s recruiting new friends of freedom. Many hunters get frustrated because their kids would rather play video games than come along on a deer hunt. How do you break through that? 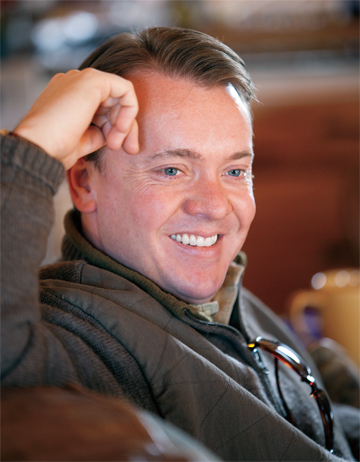 Ted: By reeking of exuberance, passion and extreme joy when sharing the hunting experience with everyone. We are very proud that our Spirit of the Wild and Tooth Fang and Claw TV shows have more young viewers than any other shows because they know that Uncle Ted is the real deal. My pure excitement on each and every outing is contagious. For many years, my gung-ho promotion of hunting and guns on all sorts of unfriendly media has always been a home run. Believe me when I say that when promoted honestly and unapologetically, the truth about guns and hunting is received positively by the youth audience. Fred Bear used to hear criticisms of my gung-ho attitude. 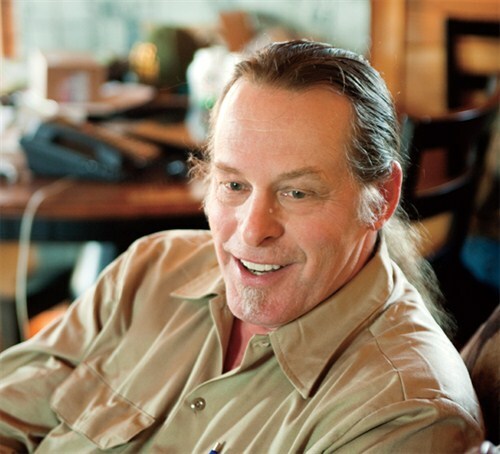 Then he would go to a bunch of sporting shows and he told me that every young person that approached him asked about this rock ‘n’ roll Ted Nugent guy. And Fred was a little surprised because he wasn’t really tuned into the rock ‘n’ roll world. But he became tuned in, and real quick, because all these young people were pursuing an outdoor lifestyle because of my attitude, which obviously put my enthusiasm in the asset column. It wasn’t a liability—it was an asset. Fred with his oxygen bottle plugged into his nose one day …he put his arm on my shoulder and he told me to ignore my critics. That he’s never seen anything in his life that has impacted so many young people as this rock ‘n’ roll wild man with a bow and arrow on stage. So he told me to ignore my critics and keep doing it the way that I’m doing it because I’m connecting with the young people. Now, I didn’t need that authorization and I didn’t need that vote of support, but boy was it powerful. Coming from a man who I just worshipped the ground he walked on. And so then just a few months later he died. And I took his instructions from that October day to not just keep doing it like I’m doing it, but to spearhead and focus my natural and instinctive celebration of my hunting lifestyle as the ultimate promotional tool for getting kids off the streets and away from the gangs and away from the drugs and all the deadly highs and get them into the spiritual highs of connecting with the good Mother Earth and the healthiest diet known to man. Duh! So I started a camp for kids, so I really give Fred Bear the credit for inspiring me to not just mention my love for hunting and write about my love for hunting and bring it up in the interviews, but to actually focus it in a activity, in a charity. 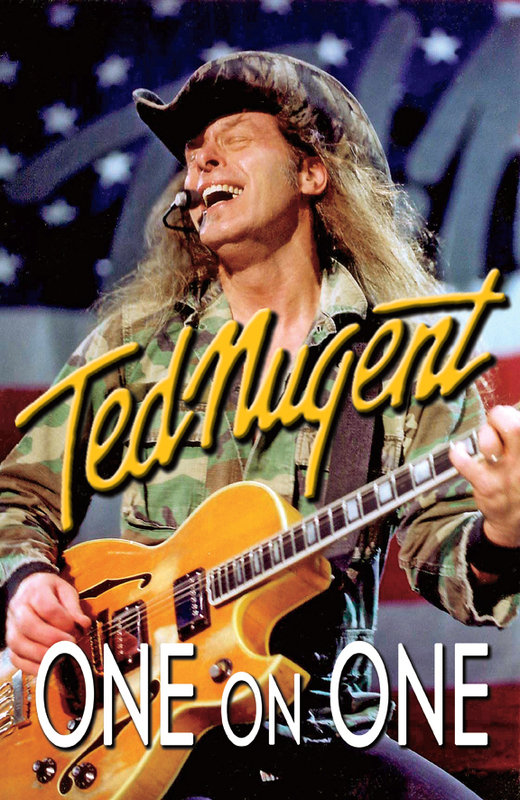 The Ted Nugent Kamp for Kids was born in 1989 and we still hold it every year in Omaha, Nebraska. And it looks like now we’re about to marry it with the National Field Archery Association so we’ll go from thousands of kids each year to possibly tens of thousands of kids each year. And we teach them the joys and the gratification of discipline. Discipline of aim small, miss small. The discipline of eating well, taking care of your sacred temple, avoiding poisons at all costs, fighting the live peer pressure, and demanding that of your friends—becoming a positive peer influence. And that charity … I mean, you should see now some of the letters I get from some of the original kids that attended our camp. We teach them hunting safety, we teach them archery marksmanship, we teach them rifle marksmanship and handgun marksmanship, we teach them the basics of sustained yield habitat carrying capacity, the perfection of venison as a life source. And I get letters now from the original participants that are now parents who are now bringing their children to the Ted Nugent Kamp for Kids. And it’s not my baby. It really is about the volunteers because it takes an army of volunteers. Cox: Glenn Beck invited you to deliver your message to the tea party movement. Where do you think that’s headed? Ted: This wonderful "we the people" reawakening is headed for where I was way back in the 1960`s. We are driven to take control back from bureaucrats out of control. We are demanding accountability and representation driven by the U.S. Constitution. I was a tea partier back in the ‘60s. I was a tea party that was criticized for being a freedom lover and a freedom fighter. I was screaming from the mountaintops in the ‘60s that the Second Amendment means I get to carry a gun. Right-to-Carry has taken a long time, and it always takes an army. So it’s long overdue but better late than never. Cox: You’re right about the army – our grassroots army is our single most effective asset. And you meet the nicest people when you work directly with the grassroots. Ted: I’m not exaggerating, Chris. I can’t walk 10 steps in America without someone saying, “Hey, Uncle Ted. God Bless the NRA.” They’ll come up, and I can see them fumbling. I know what they’re doing because it happens all the time. They’re fumbling to show me their NRA card. I am so blessed by that connection. Everybody picks up my tab and I hate when they do that because it’s not necessary. I’ll be eating somewhere and I’ll go to pay the bill and they’ll go, “That guy paid it.” And the guy flashes his NRA card. How cool is that? So maybe in this article, I’ll ask the members, “Would you people quit doing that please?” I appreciate the support, but it’s really unnecessary. If you’re going to buy anybody a meal, wait till you see a GI. Maybe a cop. Or maybe a special needs kid. Buy them one. But that’s an amazing human dynamo. And that connection -- it buoys my spirit everyday. Cox: Same here. From the questions I get on the road, I know our members always want to talk guns. Let’s hear about your collection. Do you have a favorite hunting rifle? Ted: Absolutely. Well, I have so many of them. In fact, my buddies are here and we’re going to try to take all of my guns out of my safe and take a picture. We figured it’s a 5-day deal. I have so many rifles. Currently I have a GA Precision .270 Winchester that George Gardner built for me. That “GA” stands for gnat assassin. You can assassinate gnats with his rifle. Cox: And what’s your carry rig? Ted: I own way too many guns, but rotate my dozens of wonderful 10mm pistols for daily carry. There simply is no better daily carry caliber for self defense and hunting backup as far as I`m concerned. I love ‘em all. I mean they’re all perfect. I would say my favorite gun is whatever is next to me with the most ammo. Cox: We’ve got the Annual Meeting coming up in Charlotte. Any special events or appearances planned? 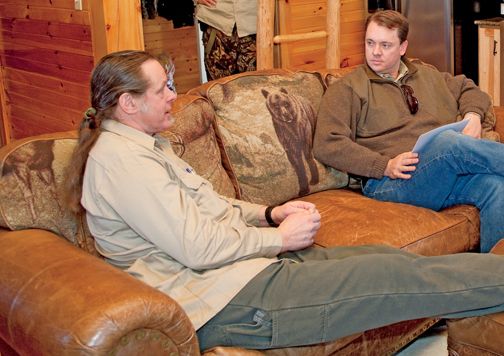 Ted: The NRA Annual Meeting is a priority for the Nugent family. I am moved by the buoyant spirit and positive energy at every event. We have a grand old time at my annual charity fund raising book signings and speaking presentations on Sunday. I so look forward to it every year. I’m glad we’re doing this interview and I certainly want you to convey how deeply moved I am, how humbled I am, how driven and inspired I am every day of my life by the honor of being voted on the Board of Directors of the NRA. I hear from these people why they vote for me. Because of my absolutism. Because of my celebrating, not defending, our God-given rights. So here in the pages of the NRA publications, thank you all, God bless you all, because your inspiration is causing me to turn up the heat on a daily basis. I bring in a whole new intensity to absolutism every day of my life, inspired by those who honored me with their vote, indicating to me that they trust me to represent them on the board -- and certainly inspired by all those NRA members in military fatigues who thank me for implementing their freedoms that they have sacrificed to provide. Cox: You have developed a lot of interesting nicknames over the years—Tedator, The Nuge, Uncle Ted. If a member sees you in Charlotte, or at some airport sometime else, what do you want them to call you?